Writing a new chapter to the guitar of choice for artists in rock, pop, country, blues, folk, jazz and beyond, GIBSON ignited its next era at NAMM in Anaheim, California. The pre-eminent American-made instrument brand revitalized, re-envisioned and recharged its core mission, paying homage to its storied history as it embraced the next vanguard of musicians independent of generation, gender and genre. NAMM represented a series of achievements for GIBSON including a NAMM Milestone Award for 125 years in business and the new Les Paul Standard 50s guitar went on to win “Best Electric Guitar of NAMM” from the editors of Guitar, Total Guitar and Music Radar magazines. Attracting widespread critical praise, the GIBSON Experience at NAMM brought in a stunning array of new and old guitars in a relaxed atmosphere. 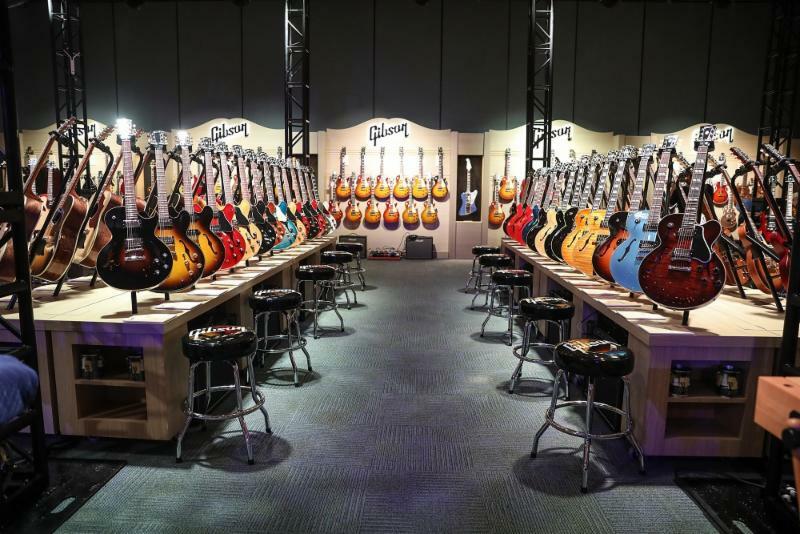 Players could pick up their guitar of choice in the GIBSON room and plug in, put on headphones and sit down to play on their own terms. On January 23, 2019 GIBSON commenced the week by launching the Chuck Berry Tribute ES-350T which marks the first-ever collaboration with the rock n’ roll pioneer’s family. Chuck Berry’s son Charles Jr. and grandson Charlie took the GIBSON stage alongside Jared James Nichols and introduced the instrument and delivered a powerful performance of “Johnny B. Goode” that thrilled the packed crowd and set the fast-paced tone for the entire festival. For January 24, 2019, GIBSON’s opening party maintained its momentum well into the night by hosting the week’s hottest nighttime event, the NAMM JAM "Legends and New Icons" at City National Grove of Anaheim. The opening party saw a bevy of legends share the stage, including none other than Billy Gibbons, Nancy Wilson, Peter Frampton, Robby Krieger, Emily Wolfe, Black Pistol Fire, Cam, Jared James Nichols, Toby Lee, Lauren Ruth Ward and more. Meanwhile, the “house band” comprised Jimmy Vivino, Kenny Aronoff, Darryl Jones and Jeff Young. January 24, 2019 through January 27, 2019 saw the GIBSON Experience welcome a diverse range of artists to the second floor in Room 207 for signings, Q&A’s, appearances and special live performances. These events comprised a roster of legends, icons, and future stars including Nancy Wilson of Heart, Robby Kriegerof The Doors, Rick Nielsen of Cheap Trick, Lee Roy Parnell, Jason Hook of Five Finger Death Punch, Brian Ray (Paul McCartney), Brendon Small of Metalocalypse and Dethklok, Chris Traynor of Bush and Helmet, Billy Howerdell of A Perfect Circle, Michael Clifford of 5 Seconds of Summer, Lari Basilio, Vivian Campell of Def Leppard, Cam, Emily Wolfe, Frank Hannon, Toby Lee, Striking Matches, Luis Maldonado of Train, Trini Lopez, Michelle Arseneau, Gina Chavez, GianMarco, Austin Sexton, Brooklyn Allman, Spindrift, Leo James Conroy, Monica Valli, Carly Jo Jackson and more.